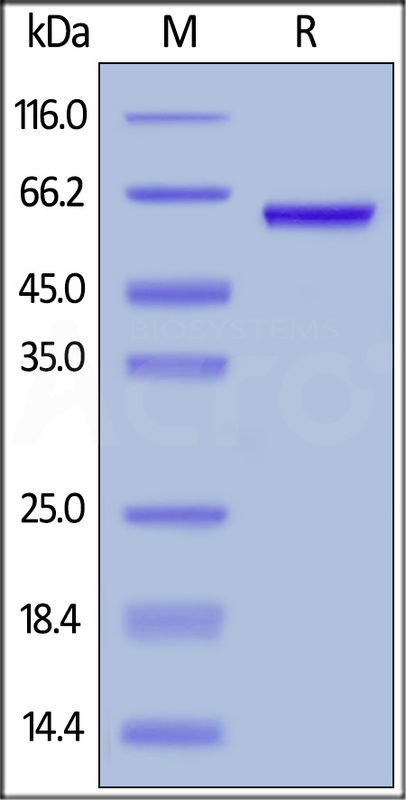 Human HMGB1, Mouse IgG2a Fc Tag, low endotoxin (HM1-H5255) is expressed from human 293 cells (HEK293). It contains AA Gly 2 - Glu 215 (Accession # P09429-1). This protein carries a mouse IgG2a Fc tag at the N-terminus. The protein has a calculated MW of 51.6 kDa. The protein migrates as 60 kDa under reducing (R) condition (SDS-PAGE) due to glycosylation. Human HMGB1, Mouse IgG2a Fc Tag, low endotoxin on SDS-PAGE under reducing (R) condition. The gel was stained overnight with Coomassie Blue. The purity of the protein is greater than 95%. High-mobility group protein B1 (HMGB1) is also known as high-mobility group protein 1 (HMG-1) and amphoterin, is a member of the HMGB family consisting of three members, HMGB1, HMGB2 and HMGB3. HMGB1 is a non-histone architectural chromosomal protein ubiquitously present in all vertebrate nuclei and binds double-stranded DNA without sequence specificity. The mechanism of inflammation and damage is binding to TLR4, which mediates HMGB1-dependent activation of macrophage cytokine release. This positions HMGB1 at the intersection of sterile and infectious inflammatory responses. HMGB1 has been studied as a DNA vaccine adjuvant and a target for cancer therapy. (1) Wang H, et al., 1999, Science 285 (5425): 248–51. (2) Yang H, et al., 2010, Proc. Natl. Acad. Sci. U.S.A. 107 (26): 11942–7. (3) Yang H, et al., 2010, Biochim. Biophys. Acta 1799 (1-2): 149–56. (4) Fagone P, et al., 2011, Gene Ther. 18 (11): 1070–7.